Are you ready to start creating your own online course, but you're worried it will either be too long or too short? 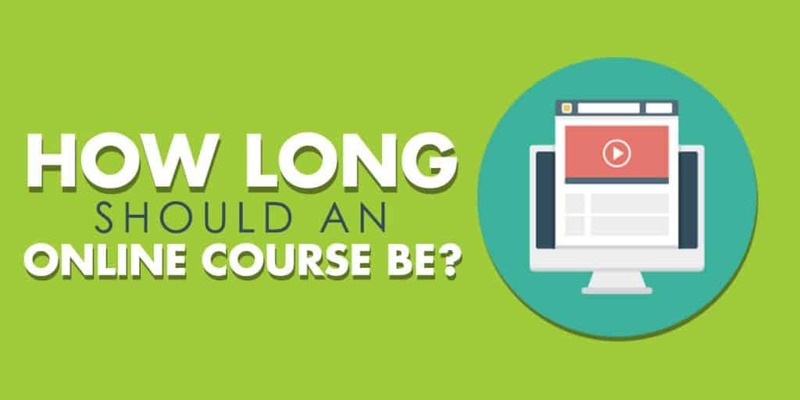 How long should an online course be? An online course should be as short or long as it needs to be in order to deliver the learning outcomes it promises. In practice, you might create a course that only has a few short 5 minute videos to teach something simple. For a more in depth flagship course you might make 25-50 video lessons each 5-20 minutes long. Getting the right course length can be a fine line. You don't want it to be so long that your students start to get bored, but you don't want your course to be so short that people feel ripped off either. In this article, I'll give my opinion on how long I think an online course should be. As well as how to split your course into smaller more manageable sections, and some extra tips and tricks to keep learners engaged. It all depends what the purpose of your course is. The most important thing is to deliver the learning outcomes that your course originally promised, whatever length of a course that takes you to achieve. If you're just using a small course as a way to get people to opt in to your email list, it might only be a couple of videos that are a few minutes long each. If you're wanting to sell a course for $100, you'll want it to be longer and put a lot more effort into it accordingly. Price isn't necessarily directly correlated with how long a course should be, but it definitely plays a factor. The learning outcome being delivered should always be the main focus of your course though. If you make your course too long, people will get bored and never actually finish it. But if it's too short, people might not feel like they're getting their money's worth. This is just an example – there’s no correct answer to how long a course should be. The best advice is to make it as short as possible whilst teaching everything your students need to learn to deliver the outcome they signed up for. If you're wondering how long it might take you to create your online course – I have an article on that over here. How Long Should Individual Sections Of A Course Be? You can have a longer overall course as long as you're splitting it up into different sections, chapters, or modules (these all mean the same thing). Each module might have 3 – 10 individual lessons within it which all hold together as a related subject or step in the learning of the bigger outcome. Each lesson of a module should be kept nice and short; just 5 – 20 minutes long. It's best to create your courses with busy people in mind. A good amount of your students are likely people with full-time jobs and families to take care of. So it's not convenient for them to sit down and watch a 30-minute video each day. Also, psychology shows that people retain information better when they're given it in small portions with breaks in between (source). This even works for memorization. For example, it's much easier to memorize a string of numbers that are broken up like 654 987 321, rather than trying to visualize it all as one long string like 654987321. Besides providing a better user experience, making smaller chunks of content helps you as a creator too. If you need to go back and update or modify one lesson in your course, it's much easier to correct a 5 minute video than a 25 minute one. If one lesson is getting a bit too long, consider splitting it into two separate lessons and find a logical point within it to do this. Spacing out learning events is shown to improve learning and retention of information. Most courses have fundamentals introduced in the beginning and then build upon them, and if you do this your students will feel like they understand bit by bit the bigger picture you are teaching them. Creating a good course structure is really important for the student experience and for helping you in your course creation, so for more detailed guidance check out this article about creating a course outline. You might want to give your students an overview with specific instructions, such as to only complete one section of the course per day, or to do certain sections or tasks before moving on. Some course platforms will even allow you to set the course so that only one section will unlock every 24 hours to prevent people skipping ahead (this is often called ‘dripping’ course content). Another way to make your course interactive is to add activities between presentations. So one section of your course may have 5 minutes of video. Then students are instructed to pause and complete a worksheet before returning to watch the remaining 5 minutes of video. What Factors Affect How Long A Student Can Concentrate? Interest in the subject. If someone is passionate about a subject they'll be able to focus on it a lot longer than something that they find boring. You might be able to get away with longer course sections in an online course about motorcycle riding compared to academic courses like learning biology. Making sure your course is relevant and appeals to your audience will help keep their attention. Interactivity. People feel much more engaged when they're playing an active part in their learning. Just think, is it more fun to play a game yourself or to watch someone else play it? Break up your lessons with moments of introspection and ask your students to come up with their own answers and write them down. This can help keep them interested and makes them feel more in control of their own learning. Throw in quizzes, question and answer periods, feedback forms, surveys, and other interactive pieces to keep students involved. Production value. It's more pleasant to watch a video presented in 1080p than one in 360p quality. And it's easier on the ears to listen to a quality microphone with noise canceling compared to one with settings poorly adjusted that's constantly popping. Cheap visuals or not having your material logically organized can take away from the learning experience as well. What are some more tips to keep readers engaged? Make your course an adventure. Give your students a reason to explore the course content. Even if that means making some kind of scavenger hunt to get them to go back and look at material multiple times to find a hidden word or something similar. Make them prove they understand. Use quizzes and tests as a way to measure success. They not only show you that your students are engaged in your lessons and absorbing the material you're teaching, but it also makes your students feel like they've accomplished something too. Give extra information. Link out to extra guides, optional reading, and resources on your lessons in case students want to learn more about one specific area. It's a great way to reinforce what they're learning and encourage them to seek out even more information. How do I make cuts if my material is too long? How do you condense hours of learning into a simple 5 – 10 minute video? It can be hard to accomplish. Instead of sacrificing quality content that you feel should be included, it's usually worth splitting it out into multiple sections of the course. What if I find it hard to talk for long periods of time? Some people can naturally talk for hours straight, while others need to stop and take a sip of water every couple of minutes. If you're the latter, breaking your videos or audio recordings into smaller segments can really help with this. You can simply upload shorter videos that are only 2 to 5 minutes at a time. Or you can edit together shorter segments into a longer 10 minute video and your students will hardly notice that the video was shot in more than one take.